When writing the Power Of the Seed several years ago my research lead me to the food industry as a source for finding new and unusual oils. 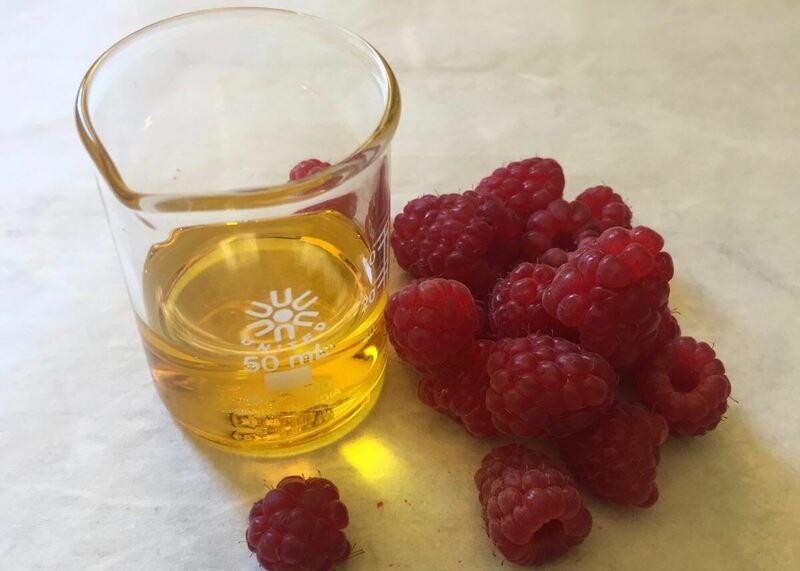 Particularly intriguing was the idea of raspberry seeds and raspberry oil. Little did I know at the time, that not far from where I live was a region just below the Canadian border producing lots of raspberries for jams, jellies and juices. And as a by product, …. oil. 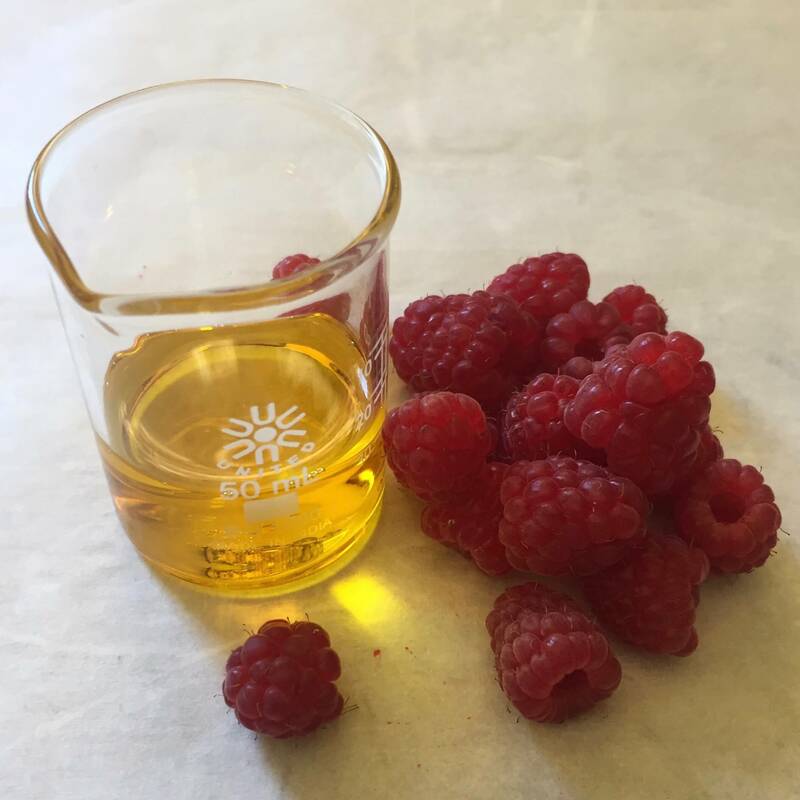 Last week, Bob at Berry Beautiful reached out to me to say he is a producer of raspberry and cranberry seed oils and did I want to see the process. Did I ever. The best part is that his operation was just 2 hours away. So one very rainy day my daughter Olivia and I drove to a town just south of Seattle to meet Bob and his daughter Joy to see the process of pressing raspberry oil. I’d like to share some of what I learned with you. First, you need a whole lot of raspberry seeds, tons to produce very much oil. Done well it is a slow process so that the seeds aren’t over heated. Seeds are dropped slowly from a hopper into two seed presses and drip by drip, the oil is caught and later filtered, bottled and sold. So many details go into the process from the moisture content of the seeds - too high and they won’t give up their oil - to the temperature of the pressing process - too high and the shelf life of the oil is shortened and quality reduced. Seeing the process in action helped me to clarify a few points, which I want to share with you here. Scent in oils. Natural raw materials have scents, they smell. Perhaps they smell good, fruity, pungent, green, spicy or just bad. Every plant and its seeds have some natural odor. Often times scent is refined out of oils to make them neutral lipids for uses from cooking to skin care to a host of industrial uses. But to remove scent the oil is heated to 240 degrees - as I remember - and the scent along with antioxidants, including vitamin E is removed! The oil no longer smells. But it has also lost a lot of natural compounds that make it a good oil for the skin. Seeds also have different degrees of softness. Chew on a few cranberry seeds and they are pliable and tart, just like cranberries and a very pale pink. Raspberry seeds on the other hand are hard and resistant in the mouth and teeth. Prickly pear seeds are some of the hardest and part of the reason the pricing on the oil remains so high. This of course makes a difference in the degree of difficulty to press them for their oil. Seeds, part of the pulp and fruiting material, along with it in a wet, soft mash, in the case of raspberries is collected and the seeds separated from the rest of the pommace. Then they are dried to the optimum moisture level to be ready for the press. Each type of seed has its own perfect level of moisture for pressing. As we were talking, the press was working away, slowly extracting fresh raspberry seed oil from a giant vat of seeds. After we left the warehouse we continued the conversation about oils, quality, authenticity, and so much more over curry at a nearby restaurant. I’m looking forward to sharing so much more with you. Here's a link to Berry Beautiful.